This set of five activities are designed for use in tutor times. 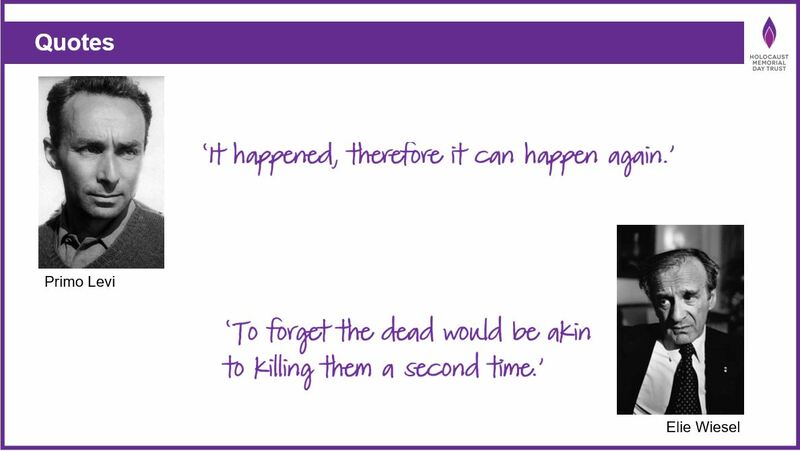 They include short activities and discussion questions to introduce students to the genocides remembered on Holocaust Memorial Day. Students will learn about people affected by the Holocaust and genocide and explore a range of themes. As well as learning more about each genocide, students are challenged to think about their own social responsibility, and what we can do to make a difference today. This PDF below contains five activity sheets, for the teacher to lead the sessions. There is also an accompanying PowerPoint with the slides for all five activities, to display to your students. These are designed to be used together. You could do the five sessions across a week to mark HMD with your tutor group. Differentiation is built in to help you adapt activities for mixed ability groups and students with SEN requirements. You may also be interested in our assembly for secondary schools. You can find these resources here.